It is no secret that we are a bit enamored with Japan but one place that we have not been previously was Hokkaido. Of course we had heard about this place; a place we had read would have flufflier snow and fresher seafood than anywhere else in this area of the world. We came to this part of Japan with hopes of eating (surprise surprise) a variety of foods including hairy crab, uni, ice cream, and ramen. What we left with, were memories of experiences that exceeded even our expectations. We had scheduled about 6 days in Hokkaido where we spent 3 in Sapporo, 2 in Noboribetsu, and 1 in Otaru. We thought that was ample time considering our to do list. Here are some memories from the trip. Sapporo is the largest city in Hokkaido and while many people were flying into the city this time of year to partake in the fluffy snow nearby, we were here to eat, explore and eat. The City had its fair share of corporate buildings and shopping centers but it was also only a short bus ride to a few places that we wanted to visit including Otaru and Noboribetsu. Sapporo is one of the biggest cities in Japan so without any familiarity of the city, we decided to stay close to the station. 40 minute’s by train from the airport (New Chitose), we arrived at Sapporo Station. Attached to the Station are a number department malls as well as the JR Nikko Hotel, where we stayed. The hotel stands tall above the city and provides some spectacular views of the urban landscape. Together, with the convenience that the hotel’s proximity provides to the train station, we could not imagine staying anywhere else in Sapporo. The city was not really in a state for us to walk around in anyway as there was lots of ice and snow so we were happy to have stayed in this hotel. JR Nikko Hotel also has a spa on the 22nd floor which was very nice and relaxing. Keep in mind that this is meant to be modeled after a traditional onsen so you do need to be naked (you get used to it pretty quickly!). Sushisei Wakichi - While we expected Hokkaido to be a source of great seafood, we did not expect our favorite sushi meal to come from Sapporo. Sushisei Wakichi is ranked 2nd in sushi restaurants for Sapporo by Tabelog (Japan’s restaurant review website) so we went into this meal with a lot of anticipation. Coming from the sub freezing, snowy weather, we were very happy to come into a cozy and welcoming, 8-9 seater restaurant. The sushi was very well proportioned in the neta to shari ratio and most importantly, each course came together so nicely. Anyone coming to Sapporo with an interest in Sushi should look at coming here. 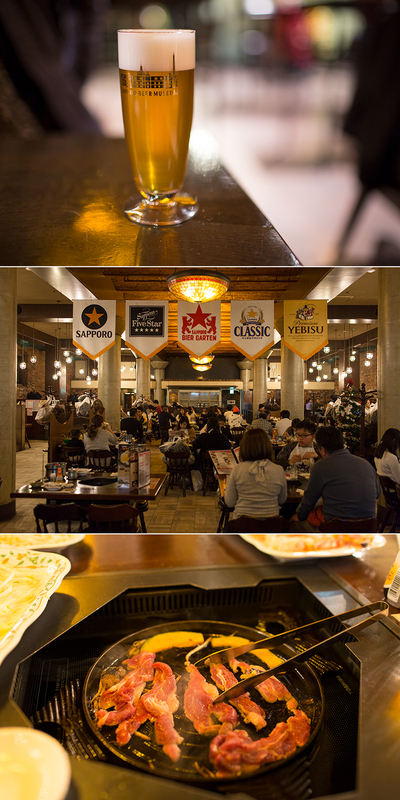 Sapporo Beer Garden (Mongolian Grill) - We did not expect Mongolian grill to be a big thing in Hokkaido but we were told it was a must do. Since it was attached to the Sapporo Beer Museum, we thought, why not? The best part about this experience wasn’t the food though - it was the beer. They have different versions of the popular Sapporo beer that you can’t find anywhere else - even in Japan. That alone is a good reason to visit. Otaru was only a 35-40 minute train ride from Sapporo so it made for a great day trip. Closer to the ocean, with its very own fish market, we knew we could make full use of our time here. The fish market was open early and while it was small, it made for a much more personal experience than one you could have at the Tsukiji Market in Tokyo. This little coastal town is also the home of Le Tao, a very well known bakery in Hokkaido (they are famous for their double baked cheese cake). While we were in Otaru, there was heavy snowfall and it was glorious. It truly felt like a winter wonderland and if you can't tell from the pictures below, we had a ton of fun in the snow. While in Otaru, we had to go into the fish market by the station and try out some of their very fresh seafood. If only we could find something this good back at home. Not only are they not shy about giving you an abundance of ingredients, the quality was about as good as you could get. Noboribetsu was only a 1.5 hour bus ride from Sapporo city center but it felt as if we had been transported to a completely different universe. Our trip in Japan entailed a lot of walking. We often walked well over 15k steps a day but during our short stay in this little town of hot springs, we walked a grand total of 500 steps. I think that adequately describes how we spent our time here. Going to a part of Japan that was known for its natural hot springs, we knew we wanted to stay in a Ryokan. A Ryokan is a traditional accommodation in Japan that goes way back. When I think of a Ryokan, I think of tatami mats, woven sliding doors, beds on the floor and that is exactly what we looked for when we planned our trip out here. We ended up staying at Ryotei Hanayura in Noboribetsu. To get here, we took a chartered bus from downtown Sapporo and they ended up dropping us off directly at the hotel. The accommodation was clean and beautiful. Our room was massive and it came with our own private onsen bath that was outdoors in our balcony. Anyone who hasn’t tried dipping into a hot pool, in the winter, surrounded by snow hearing nothing but the water around you really has to find a way to do it at least once. Trust me, it will be one of those memories that you won’t forget. Like a lingering feeling of nostalgia that you wish you could relive. Peaceful and content - that is the best way that I can describe that feeling. Noboribetsu isn’t known for its restaurants so we happily stayed in our Ryokan and dined in for all of our meals. Our Kaiseki dinners were beautiful and so satisfying with some sake after a long day of doing nothing but lounging about and dipping in the onsen. Breakfast was buffet style where we could load up on fruits, congee, and other traditional items such as ikura. There is something truly peaceful about being in Japan during winter. We ended up with some amazing memories during our short stay here and while we did not ski/snowboard as many would come out this way for, we had a blast and would come back in a heart beat. If you are a food or beer lover, enjoy onsens and just enjoy being in Japan, Hokkaido is a place that will not disappoint. We had been waiting a long time to make a trip back out to one of our favorite places on earth, Japan. Luckily, we got our chance to do that during the Christmas season again (we were here in the Winter season of 2013). Since this was not our first trip to Japan, we wanted to focus less on the touristy things and instead key in on the things we care about most (eating). The result was that our entire itinerary was centered around the restaurants we had to visit. Here are a few shutter clicks from our walks around the city. We stayed at two different hotels during our stay in Tokyo. The first three nights were spent in the Tokyo Conrad. It was hard to imagine that we could have found a more comfortable and luxurious stay in Tokyo. Since it was our first trip in over (an exhausting) half a year, we figured we would spoil ourselves a bit. We felt spoiled. The Tokyo Conrad is located in the Shiodome area which is within walking distance to Ginza (for shopping and eating) and the Tsukiji Fish Market. Both locations were about 15 minutes away. We made full use of the location and walked around a bunch. Needless to say, we thoroughly enjoyed our stay here. For our second leg in Tokyo, we decided to switch it up and stay closer to Tokyo Station. The Ascott Marunouchi is fairly new and had only been open for a few months but the pictures were of a hotel that was very modern, clean, and very spacious for Tokyo standards. When we got there, we were not disappointed - in fact, it may have been nicer and definitely newer than the Conrad. Proximity wise, the Ascott Marunouchi was only about a 15 minute walk from Tokyo Station. You could get there by foot or by taking the Marunouchi line just 1 station. We felt spoiled. The view. The quality of the finishings. The space. It was an extremely relaxing and luxurious stay for our last leg of our trip to Japan. We will be back. Since our trip was all about eating, we did a lot of it. Here are a few of our highlights in no particular order. Tempura Kondo - Our first foray into tempura fine dining, we were pleasantly surprised at how refined the entire meal was. We came here for lunch on a weekday and the entire restaurant was booked full. Kondo has Michelin stars to its name and we enjoyed ourselves but would not say that it was mind blowing (maybe we set ourselves up for disappointment there). Sushi Tokami - Located in Ginza, Sushi Tokami was our first sushi stop this trip. Hiroyuki Sato is the head chef that has propelled this restaurant since its opening less than 5 years ago to now being one of the top sushi restaurants in Tokyo. The shari (rice) was plentiful (holding a fine balance between just right and too much) and was a bit heavier on the vinegar. The neta was not seasoned too much as the chef relied on the fish being served to really serve as the main driver of flavor. The meal felt similar to Sushi Sho (3 Michelin star, highly regarded restaurant in Tokyo) but we enjoyed Sushi Tokami more. Sushi Iwa - 4 years ago, we came to Sushi Iwa and had what we would like to call it the best meal of our lives. This time, we could happily call this meal one of our top 3. The selection was on point and we were happy that they kept one of our favorite dishes from 4 years ago. We would highly recommend anyone who comes to Tokyo in search of a fantastic sushi meal to come here. Sushi Suzuki - Our last sushi meal on this trip was at another recommended Sushi-ya in Ginza. The omakase this time required us to be a little more adventurous. Daiwa Sushi - A well known sushi-ya in the Tsukiji Market that is only beaten by Sushi Dai in popularity, we were excited to try this place so we could do the comparison ourselves. We came away unimpressed unfortunately. The meal was rushed and from our memory, the meal we enjoyed at Sushi Dai left a greater impression. Nakaya - Since we were staying so close to Tsukiji, we decided to roam back on another day for breakfast. We stumbled into this kaizen-don restaurant. A bowl of rice topped with delicious seafood, we had an incredibly satisfying meal. A far better experience overall than we had at Daiwa Sushi. Easily the best Chirashi/Kaizen don we have had anywhere. Ebisoba Ichigen Ramen - We love ramen and we enjoyed 5 delicious bowls of this stuff while we were in Tokyo. Ebisoba Ichigen though, may have been our favorite. They have multiple locations but the original shop is based in Sapporo. The visit was well worth it as the shrimp broth was so unique to anything we have ever had outside of Japan. Japan is amongst our favorite places on earth. This was only our second time here together but we left just as we came - longing to visit again. The food, the culture, the indescribable feeling that this country gives us keeps us coming back. Though we just left, we will be coming back sooner than later. Our trip to Hawaii included a stop for 3 nights in Maui. Originally I was thinking that a week in one location for Hawaii would be a good idea but J really thought otherwise so being the wise man I aim to be, I listened. So glad that we got a chance to go to Maui too. This island has a very different feel compared to Oahu. The country side was beautiful and you see a lot more of it. Maui just felt more wide open and sprawled out compared to Oahu. The beaches that we visited were gorgeous and the water pristine. Seriously, we thought the snorkeling right in front of our hotel to be the best of any location in Oahu that we found. There were a few things that I wished we had time to do but skipped on including doing the drive along the Road to Hana and watching the sunset from above the clouds at Haleakala but it gives us an excuse to come back. Being in Kaanapali, the drive to get to Hana would take close to 5 hours one way without any stops and we didn’t have the time. We stayed at the Westin Nanea Ocean Villa resort right by Kaanapali (north west point of the island). The hotel was only opened about 3 weeks before our arrival and you could tell right away that the décor and finishing’s were far more modern than the vast majority of hotels in Hawaii. By the time we paid for the rental, only 2 bedroom suites were available so we took it. When we arrived, we were shocked at how open and big the suite was (approximately 1,200 square feet). Equipped with a full kitchen and two full baths, this suite made coming back from the beach a nice and relaxing retreat. During our stay in Maui, we made it a goal for ourselves to find some beaches that had sea turtles and swim with one. Alas, we were not able to find one but we did visit several beaches and snorkeling locations that were beautiful. While we searched exclusively for sunrises on Oahu, being set in Kaanapali meant that we were going to be restricted to sunset photos while in Maui. Not that we minded at all though – it meant more of an opportunity to sleep in. Luckily, our hotel was located right on Kaanapali Beach. This beach was beautiful, nicer than anything we came across in Oahu. There were some driftwood/logs there that made for the perfect object for long exposures (see below). While a bit busy, it was no where near the density that we saw on Waikiki Beach. This might have been our favorite location all trip. It helped that the sunset here was gorgeous and only a few steps away from our hotel too. Nothing beats being able to set up and take your desired sunset photos and then take a short walk back to the hotel for a few drinks and some dinner. This beach transformed for sunset and I could not have been happier with the sight we saw. The smooth sand and beach logs were a perfect compliment to the amazing sunsets we saw practically every day in Maui. Oh and did I mention that this beach also had amazing clear water with lots of sea life? Perfect place for snorkeling! All videos taken with the Gopro Hero 5 (love this thing). Just north of Kaanapali Beach is Kapalua Bay, a very small cove that bears witness to a fantastic sunset. It is also where the restaurant Merriman’s is located. The tide was a little high on the evening that we came here so we had to trek through some slippery rocks in order to get to our sunset location to set up the tripod. Having said that, it was definitely worth it. We didn’t end up swimming here since we got there right around sunset however. Further north from Kapalua was Honolua Bay. There is no central parking lot to get here but when your GPS tells you that you are close, it may be time to find some parking. We just followed some of the other cars that seemingly were parking in the middle of nowhere. Once you get out of the car, you have to walk a little while in the forest before you start to see the rocky beach of Honolua Bay. The water was murky near the shore but as soon as you swam about 30 feet out, you could see lots of sea life. There were also areas with some impressive coral too. Our hunt for sea turtles brought us just a little further south from our hotel – Black Rock Beach. This beach was pristine and the water very clear. This was a great location for snorkeling too as the waves were not too rough at all for entry. The beach was fairly quiet too but then again we went during the middle of the day when it was really frickin’ hot. Finding parking to get to this beach was a bit of a doozy though. You end up having to park at the Sheraton hotel parking and will have to pay. Just something to be aware of if you plan on coming here. It may be easier to arrange for a shuttle from your hotel. As you can tell from our previous posts, we love food. We knew that we were going to get great food options in Oahu but Maui was a bit of an unknown to us. We received some wonderful recommendations though and did our own research which ended up with us having some of the best food on our trip. Here are some of the places we visited. Why don’t we begin with one of the most famous restaurants on the island? Mama’s Fish House is located in Paia (just a little east of the airport) and the beginning of the Road to Hana. We were recommended by several of our friends to go here so I made sure to make a reservation early. When we arrived and saw the setting, we could see why there was so much noise around this restaurant. This place was happening! We arrived for our 5:30pm reservation so that we could watch the sunset as we ate and we were greeted immediately by valet (the parking lot was full). The walk from the parking lot to the restaurant gave us a good glimpse of why this restaurant is so popular. To say the view is fantastic is not doing the scene justice. You see the green lawn with the palm trees swaying with the sea breeze and then you look out further and all you see is the water. We were sat at a window seat (make sure you ask for this) and had a great dinner while witnessing the sun set behind the palm trees. That is only the view but the food was great too: J had the lobster tails (2 of them) and I had the pistachio crusted mahi mahi stuffed with Dungeness crab (it even came with 1 lobster tail too). Those entrees along with a couple of glasses of good wine and dessert and we were very happy campers. I have always liked watching Top Chef. This is a show that showcases chefs with great talent and creativity and they featured a chef from Hawaii by the name of Sheldon Simeon. When we heard that he opened up shop in Maui, we knew we had to put that on our itinerary. The food served here is delicious (so good that we went twice) and so down to earth. The prices were around $15 or less. Nothing fancy here but boy did it taste good. We had the Mochiko Chicken, Pork Belly, Poke Bowl, Garlic Noodles and the Spicy Chicken Sandwich. All of the dishes (except the sandwich) was served on a bed of rice. The mochiko chicken might have been my favorite but J really enjoyed the poke bowl too. We did not have a bad meal here. We also ordered the cup of broth (a hot dashi broth) each time as well because it was so tasty and soothing. Consider ordering online so you can avoid the lineups. The restaurant is very small with very limited seating so be prepared for that as well. There were quite a few people that did take out instead. Thinking about it is just making my mouth water. With that name, we did not think we would like this sushi joint as much as we did. Goes to show you that you can’t judge too quickly about anything – especially food. The sushi here was delicious and better than most places we have in Seattle/Vancouver. The rolls were so tasty (though expensive at $24-26 per roll) and the nigiri spot on. I would definitely come back here the next time I am in Maui. Maui turned out to be the favorite part of our trip to Hawaii. It is much more our pace versus Oahu (maybe it’s just us getting older hah!). The food was great, the views were incredible and the pace of life was just what we were looking for in a vacation. Already thinking of our next trip to Hawaii and Maui is definitely a target destination (along with Kauai). The next time we get here, we definitely plan to do the road to Hana. The second half to our week long trip in Greece in June was to a place that we have had on our bucket list ever since we met. Seeing all the amazing photos taken here, we had an idea of the views we would see when we arrived but as usual, we were still left with our jaws on the floor. The temperatures during our stay were HOT though. At one point, the van we were in said it was 42 degrees Celsius! We spent our 4 days here wandering around the island - seeing Oia but also renting a car and driving around to the surrounding towns. You could see most of the island in a day if you had access to a car so I recommend that if you find yourself in Santorini. The main town on the island is definitely Oia. The days we spent here were extremely hot. But you do what you gotta do to see that iconic view. We honestly haven't sweat like that before but in the end it was worth it. To say that we saw the view in all of the post cards is pretty special. But, I will say that the view isn't just what you will experience if you want to see a sunset over Oia. What the pictures don't show is the immense amount of people clammering for that same view. It can be a bit stressful, loud, and not at all relaxing. But as in life, it's all in your perspective. We had a fantastic time here. After our 3 night stay in Mykonos, we hopped on the Seajet ferry from the new port and headed over to Santorini. Costing about $60 EUROs per ticket, the trip is only about 2 hours long and it is comfortable ride. The only issue? Be prepared to be crowded on the way out of the ferry. You’ll know what I’m talking about if you have ever been on one of these ferry rides. It may sound strange to say but our hotel in Santorini was one of the biggest highlights of our trip. San Antonio Santorini is located between the town of Oia and Imerovigli. The hotel is fairly isolated as it sits between in the middle of two cliffs but that is what gave this place such an incredible view. I’ll let the pictures do the talking even though they really don’t it justice. We spent a lot of time at the hotel during our stay in Santorini simply because you had everything you would want for a honey moon here. Infinity pool overlooking the caldera, great food at the restaurant, incredible weather, outdoor private Jacuzzi and veranda with a view, you name it. The hot temperatures during the week we were in Santorini also gave us good reason to stay in our comfortable room. We have to admit that we ate a lot at our hotel. The food was delicious and surprisingly some of the best we had on our trip. The wine menu was extensive and there was also some great variety in the food menu too. This restaurant was the epitome of a meal with a view. When we weren't eating at the restaurant, we were wandering around Oia and other towns and snacking away as we went. In all honesty, it was so hot on some days that we did not feel hungry at all. But, we did enjoy more of the grilled squid, roast lamb, and tzatziki with pita bread.